Kaabil Movie Review: Kaabil is all set to lock the silver screens on the Republic Day eve, i.e., 25 January 2017. 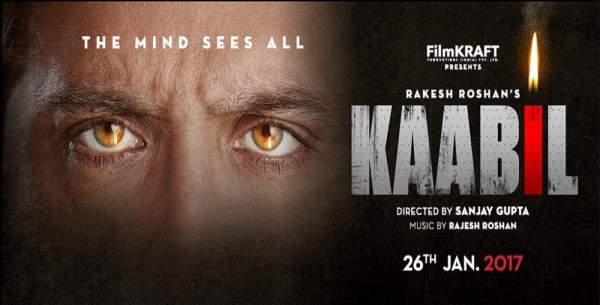 Directed by Sanjay Gupta and produced by Rakesh Roshan, Kaabil features a love birds affair between two blind people played by Hrithik Roshan and Yami Gautam. The film also stars Rohit Roy, Ronit Roy, Narendra Jha, Girish Kulkarni, Md. Sahidur Rahaman, and Urvashi Rautela (in song). In Sanjay Gupta directorial Hrithik and Yami Gautam will be seen opposite to each other. They played blind people in this revenge drama. This is the first time Hrithik Roshan and Yami Gautam have shared the screen together. The storyline of the movie is really different. Even before the release, the film already started to make headlines. Even after their separation, Susanne Khan Hrithik’s ex-wife was also present at the screening to support him. They are often spotted together with their kid. In Kaabil, Hrithik and Yami will be seen romancing each other on the silver screen. Kabil is not a typical romantic flick but a revenge drama. And it is definitely a must watch. It’s a competition between Shah Rukh Khan and Hrithik films this Wednesday. Below are the reviews of Kaabil by the celebrities who attended the special screening held prior to the worldwide release. Milap: Kaabil movie review: It is the GREATEST Revenge story EVER made in our country. The maker of #Aatish n #Kaante my Guru @_SanjayGupta delivers a MASTERPIECE! You will clap, cry, whistle, marvel at the brilliance of #Kaabil and the performance of @iHrithik He rips Ure heart out of your body! Ronit Roy: @iHrithik redefines “Performance by an Actor” in #Kaabil. Superlative and Magical! I’m so proud to be part of this motion picture! Rishi Kapoor: Guddu/Sanjay/Duggu/Yami/Sudeep/Resul-“Kabil” Winner all the way. Thrilling, http://film.Wow , chilling, entertaining. Congratulations all concerned. Loved it! Aalim Hakim: Saw special screening of Kaabil (review). One word I want to repeat. http://film.Wow,Wow & Wow. @iHrithik take a bow !!! Suniel Shetty: Hearing grrreeaat reviews for #Kaabil Sanj! So so happy for you guys…Nailed it ? Akshaye Rathi: Hearing superb stuff about # Kaabil vs # Raees looks awesome too! Hope a Gadar-Lagaan / TZP-Welcome kind of week comes by now! We all need it! The film is getting such a good response. Thus, it seems that Roshans don’t need to worry about clashing with Raees, SRK’s upcoming movie. It is no doubt that Shahrukh Khan is an audience magnet, but Hrithik has proved times and now that his dad, Rakesh always uses the Midas touch. This time it is a power and talent packed combination which audience will watch. Have you watched the film? What’s your Kaabil movie review? Stay tuned to The Reporter Times for more news!!! Don’t forget sharing. Kaabil will rock at block office . I am always pray for Hrithik up coming movies . When Mohenjo-Daro not worked at Box-office properly personally I feel nervous. I M Huge fan of Hrithik Roshan. One suggestion for Hrithik Roshan ki aap movie ki publicity me thode kamjor lagte ho . Aap ko apni movie ki zor shor se publicity karni chahiye. Salman aur shaharukh is mamle me aap se aage he sir. Example Shahrukh Happy New Year Film kya khad he is movie me jo Box-office pe hit hui .